HSSC PGT Psychology Final Result 2018 - www.hssc.gov.in - Haryana PGT Document verification Schedule Download HSSC PGT Interview Call Letter Appointment Joining Letters. Latest News (02.12.2018) – HSSC PGT Psychology (Rest of Haryana) has been declared now. Final Result for the post of PGT Psychology (Rest of Haryana) For School Education Department, Haryana Against Advt. No. 4/2015, Cat No. 14. HSSC PGT Psychology Answer Keys 2016 (02.04.2016): The answer keyakeys of Hindi, Punjabi, Psychology, and Physical EDUCATION HAS BEEN uploaded now. 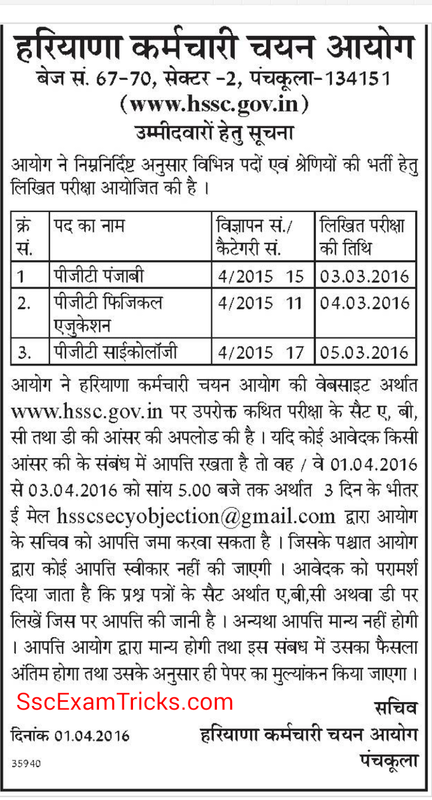 The objection can be uploaded from 01st to 03rf April 2016 on hssc.gov.in. 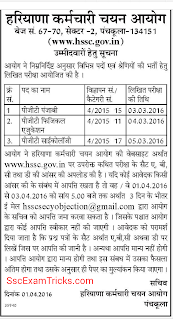 List of PGT Vacancies in HSSC Recruitment 2015- No. of Vacancies of 8145 PGT in HSSC Recruitment 2015: Total 8145 vacancies are available for PGT in Haryana on official website www.hssc.gov.in. The list of HSSC PGT Vacancies in various subjects is given in below table.